Partial dentures are a great solution if you are missing some teeth. Our custom dentures will fill the gaps in your smile and allow eating and talking easier. A partial denture may be a more suitable option depending on certain circumstances such as lack of remaining teeth as a support structure, limited bone or financial means. 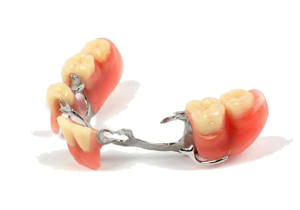 Partial dentures are a great way to help restore chewing function by use of clasp or hook systems that clamp on to remaining teeth to support and stabilize your denture. Depending on the condition of your remaining teeth you may be better off with dental implants. As with any dental care, ensuring ongoing maintenance with your dentures is crucial to prevent sores and damage to the remaining natural teeth. We strongly recommend that you come in for a check up approximately every year to ensure a proper fit and confirm proper fit and function of your partial dentures.